Larder Fridge White PHUC49L/H Pack of 1 Igenix Larder Fridge with energy class A and 102 litre capacity. Features interior light, auto defrost, reversible doors, in door storage, two glass shelves and salad drawer with glass shelf. dimensions: W500 x D494 x H858mm. 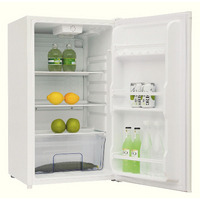 Igenix Fridge With Icebox White IG3920 Pack of 1 Igenix Fridge with Icebox. 98 litre capacity fridge with 4 star freezer compartment, reversible door, 3 door shelves, adjustable glass shelf, salad crisper and adjustable thermostat.